You see, right from the beginning I told my kids Santa is pretend. When I explain this to people, it pretty much kills conversation. They almost always react with disapproval – telling me that I’ve robbed my kids of something special: the chance to believe and belong. I can see that they picture an austere Christmas in our household: plain lentils for lunch, followed by an action-packed afternoon of chores. And they can imagine all the other things that must be outlawed in the Spartan cave of our existence: junk food, television, toys, laughter. The judgement comes down so swiftly and loudly that I never get the chance to explain – far from missing out, my kids always had loads of fun not believing in Santa. Their dad and I decided early on that we wouldn’t be hoodwinking them about the Jolly Fat Man. Our rationale was pretty simple: if we spent years building up a false belief in Santa, how could we expect them to trust we had their backs and were telling the truth about any of the Really Big Stuff? 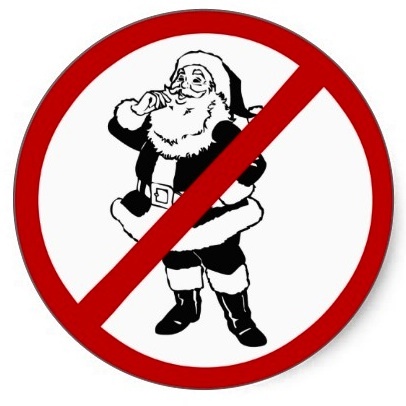 It wasn’t as if we enacted a Total Santa Ban in our home. In fact, I’d argue that knowing Santa was make-believe gave the kids scope to fully enjoy him. They wrote him charming notes on Christmas Eve. They helped cook cakes and bake biscuits to leave out for him, all the while making knowing references to the fact that he probably had similar tastes to their sweet-toothed dad. They guffawed when the carrot they left for Rudolph was still there in the morning, because coincidentally, their father wasn’t big on raw veggies. As planned, we avoided the angst and distress of ever having to break the news about Santa, but there were also serendipitous side effects. For starters, we scored all the kudos for the kids’ Christmas presents. Okay, I’m being flippant on that point – it had nothing to do with the glory of being the celebrated benefactors of a bunch of cool stuff. In truth, when the kids were little we didn’t have a lot of stuff to give – cool or otherwise. But knowing that we were the ones doing the gift-giving meant that they recognised and appreciated the love and thought that went into their Christmas presents from early on. They grasped that these were heartfelt gifts from people who cared deeply about them, rather than windfalls from a stranger who magically knew what they wanted and might naturally be expected to fulfil their exact specifications. So however meagre the gifts might be, the kids felt a sense of specialness about them. 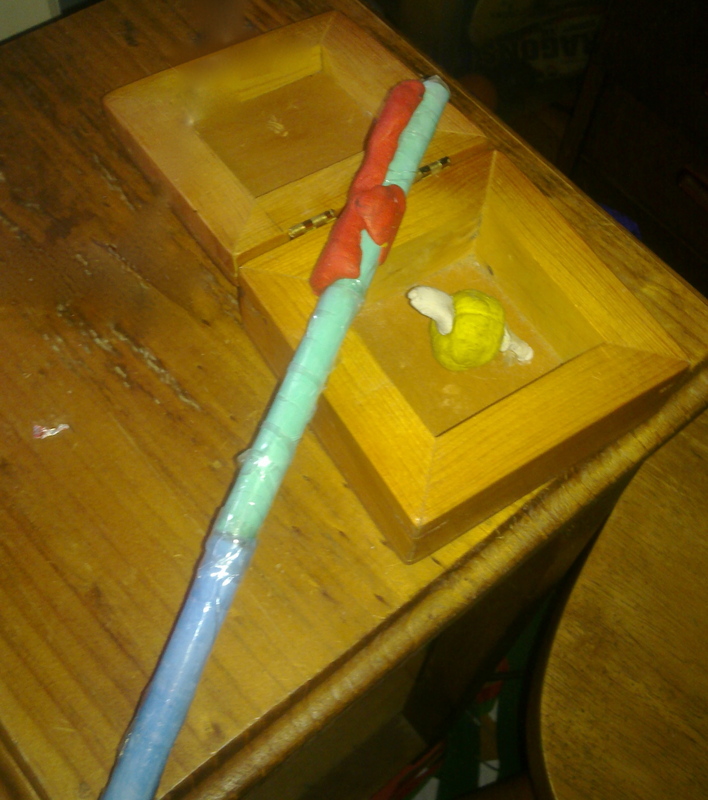 And they embraced the idea that real magic is a do-it-yourself project. 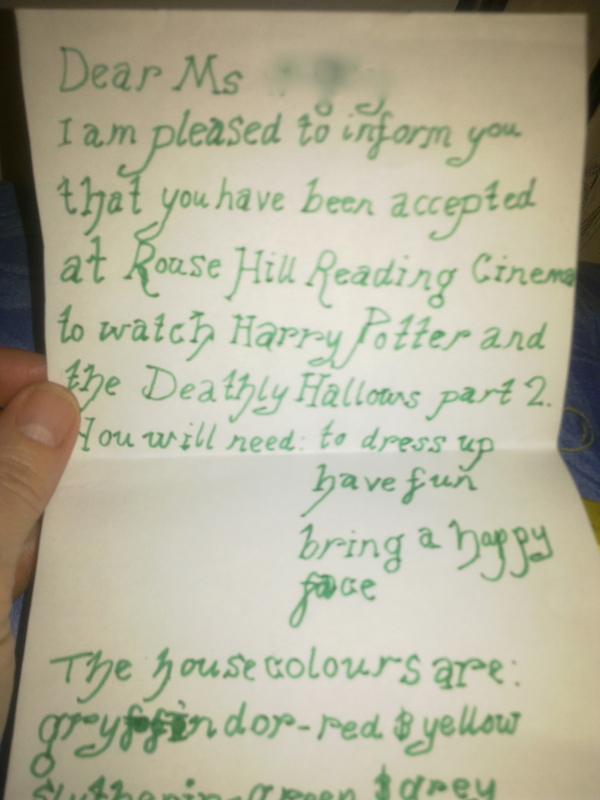 Two years ago the last instalment of Harry Potter was released in Australian cinemas on my birthday. The kids – who were 13 and 11 at the time – came up with an inspired plan. 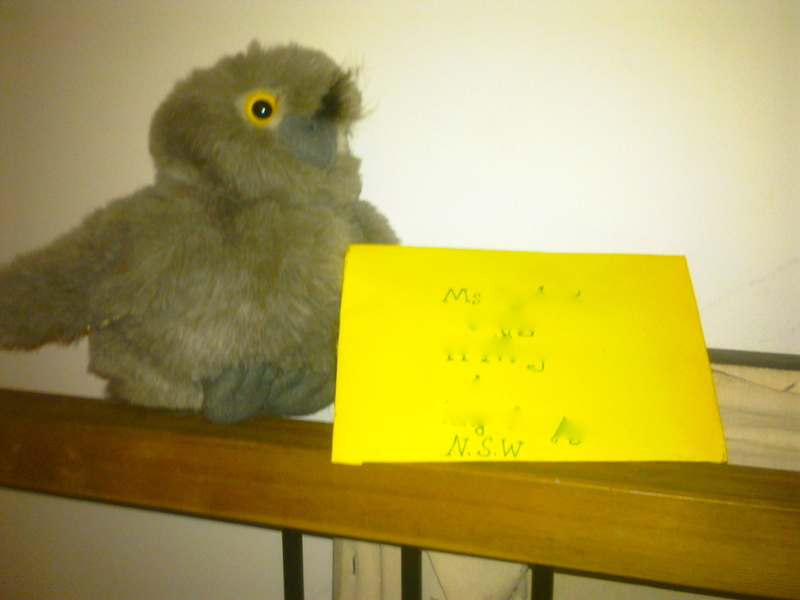 A week before the release date, I found a toy owl on my bed, with a letter under its wing. 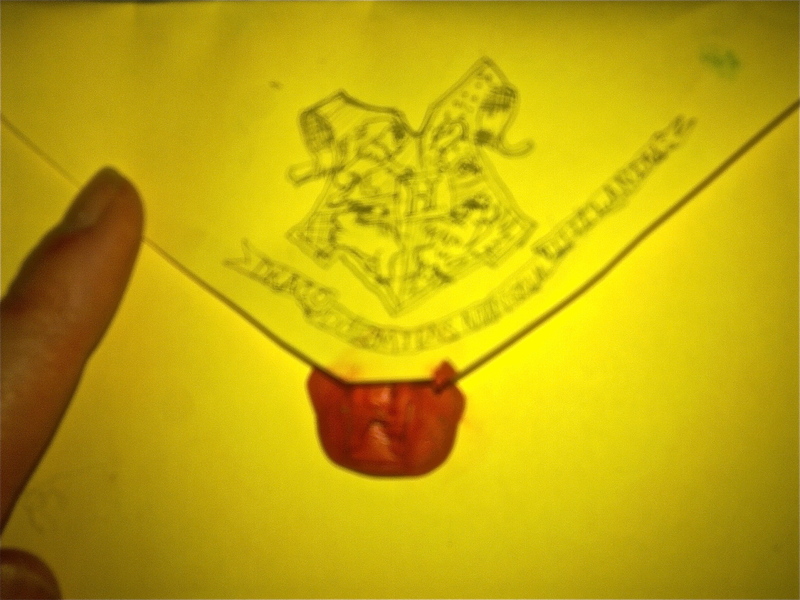 Written in green ink and sealed with red wax, it was a handmade birthday invitation to see The Deathly Hallows – Part 2 with them. On the eve of the date, they stayed up late and made Potter-themed treats from recipes they’d found on the internet – butter beer, white chocolate wands, biscuits shaped like broomsticks and witch’s hats. I would never have dreamt up something so perfect to put on a wishlist, even if Santa did do birthday requests. It was such an imaginative and thoughtful gift. So, yes. My kids did miss out on the wonder of believing in Santa and his flying-reindeer variety of magic. But they also gained a powerful and enduring sense that magic can be something you create for yourself – and share with the people you love. This entry was posted in I was thinking..., The big bag of crazy and tagged childhood, Christmas, giving, humour, imagination, make believe, parenting, Santa, WPLongform. Bookmark the permalink. I don’t know what you’re talking about. I still believe that Santa is real. Heh heh. Hope he rewards your belief with something extra nice this year! Thank you 🙂 Perhaps if you saw me in my dressing gown at 5am on Christmas morning, you might spot a resemblance to the green, grouchy one. But most of the time I think we’re Grinch-free! I love this, and if I had kids I’d take a similar approach – glad to hear it’s had a positive effect! I had a horrible experience as a kid, got in big trouble over something all brought on by my adult-spurred belief of Santa. When I found out a year or so later that he wasn’t even real I was utterly disgusted. I don’t feel so strongly about it now except that I wouldn’t go lying to my kids, especially making them afraid. I definitely think it’s spot on for kids to really know where their pressies come from, appreciate their parents more perhaps, too! Oh no! I’m sorry to hear you had such a horrible childhood experience. I know our approach was only one of the many different ways to make kids’ experience of Santa lovely. But I’m sure that the naughty list is reserved for adults only – particularly the ones who use Santa as a scare tactic! I made my feelings about getting a cabbage patch doll very clear to Santa, while sitting on his lap in a mall when I was about seven. I don’t remember what Santa got me but I will always remember it wasn’t a cabbage patch doll. I suspect now that my parents couldn’t afford one, but since I believed Santa brought the gifts I thought for about a year that I sat on the naughty list. Which is pretty heartbreaking for a small child. I completely agree with your views on Santa, I’ll be doing the same when my child is old enough to understand. What a cruel misunderstanding for a little kid! The idea that you could be judged wholly naughty without any way to redeem yourself is a pretty daunting idea. I hope that it was dispelled before the next Christmas rolled round! I believe that I took great delight in being as naughty as possible. It felt like permission rather than a punishment! Of course, underneath it was hurt, and yes, I was thrilled when I found out that Santa didn’t really exist – that way they had to give me presents, naughty or nice! I love that! It brought out your inner ninja. Good for you! I hope the growth of Santa adds to your rich Christmas traditions rather than overshadowing them. Enjoy your festive season!